Have you ever had bamboo go crazy in your garden? My parents planted some along the side of our house when I was little and seemingly overnight it was a bamboo forest. My dad spent the next five years trying to get rid of it. Bamboo belongs to the grass family, grows quickly (it can grow over a metre a day) and requires no irrigation, fertilisers or pesticides. Environmental benefits of bamboo aside, it is also light, strong, durable, plentiful and can be used in many different forms including fibres for fabric or paper and large stems in building construction. Bamboo is being used increasingly in children’s products and can be found in everything from clothing and toys to furniture and toiletries. We have reviewed a wide range of bamboo products previously on Babyology, but here is a summary of the latest. 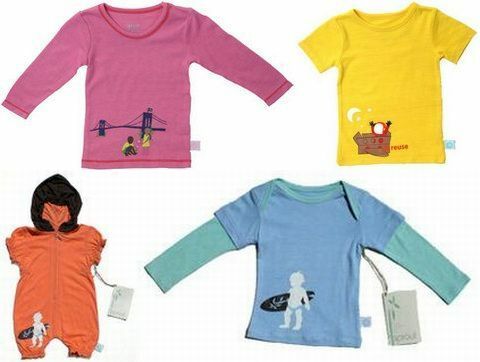 We have focused on the concept of bamboo as children’s clothing and furniture and have a few brands to share with you. As a fibre for clothing, bamboo has sought-after characteristics – it needs no chemicals to extract the fibres so is an excellent choice for children with sensitive skin. It keeps skin dry by drawing away moisture; is warm in winter and cool in summer; has inbuilt anti-bacterial properties and is odour resistant even after many washes. Add to this impressive list the fact that the fabric is incredibly soft and you may well have the perfect fabric choice for babies. Bamboo fibre and bamboo blended with cotton is a favourite with many designers for clothing. For soft and sweet baby clothing, begin with Babyjo, Lotus Linens and Nature Within. Practical and lovely baby basics include simple striped blankets ($32.95) and gorgeous kimono-style rompers and pyjamas (from $22.95) from Babyjo (above). Lotus Linens have a beautiful range of printed and plain wraps (from $27.50), cot linen and quilts in their retro-inspired ‘bubble’ print, sleeping bags and a large range of baby clothing (pieces starting from $12.30). Mums and babies benefit from the gorgeous range at Ramalama (above). As well as bodysuits, rompers and tees in a simple, neutral colour palette, Ramalama stock a large range of maternity wear made of bamboo fibre including tees, dresses, skirts and the perfect cardigan for autumn. Baby clothing starts at $17.45 and maternity wear at $34.50. Ergopouch are well known for their sleeping bags, particularly the Cocoon which saves an awful lot of swaddling issues, but they have recently introduced a collection of funky pyjamas that will appeal to older children (above). For older children, fashion pieces by designers Kicky Pants (above), Sprout and Agoo all offer something different. Kicky Pants, available from Mudd Kids, feature simple designs in rich autumn colours – orchid, pond, bark and lotus. American based Sprout feature bright pieces with a surfer edge that are designed to mix and match (below) and Agoo have a great practical range designed for active kids, including fleece jackets for winter. Bamboo is not only for wearing. 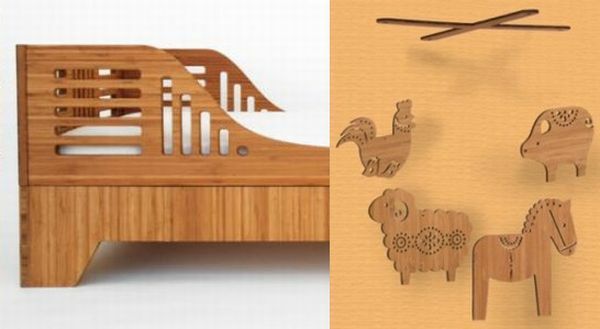 The Hape range of bamboo toys is a fantastic example of the versatility of bamboo. From bamboo tubing used for toy cars through to beautiful polished wood bamboo floors in the Sunshine Dollhouse, each piece is crafted with sustainability in mind. New to the Hape collection is a fantastic greenhouse for budding gardeners and some incredible bamboo stacking blocks. The stacking blocks are unique. Bamboo is cut at different angles and the rim of each piece is dipped in a velvet-like coating to provide ‘grip’. The distinct angle of the bamboo creates endless building possibilities. Seemingly defying gravity, the stacking blocks will be as intriguing for adults as they are for children. Hape toys are available in Australia at Educational Experience. Our more unusual bamboo finds include soap, a bamboo potty and bikes. Bamboo baby soap from Bamboosa is perfect for sensitive and delicate skin and is priced at US$7.25. For the most eco-friendly toilet-training, the Becopotty by Becothings is made from bamboo waste and rice husks and is fully biodegradable. The Becopotty is £7.99. 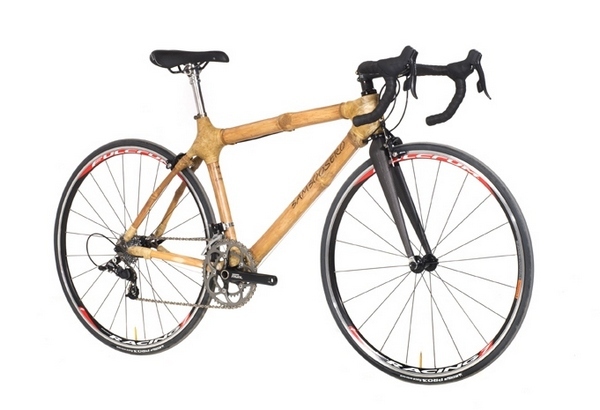 Demonstrating the strength of bamboo as a building material, bamboo bikes are available from Bamboosero. The bike frames are built in Ghana and provide small communities with valuable employment. Bikes start at US$495. Finally, if you are looking to decorate the nursery with bamboo, you can’t go past decor pieces by Petit Collage, furniture by Kalon and bouncers by Bombol. We have reviewed these and many other fantastic bamboo products before so be sure to browse through previous posts for the pick of the crop.